The Meteorological Directorate at the Ministry of Transportation and Telecommunication has reported in its monthly weather summary that November 2015 was warmer than normal in temperatures, below average in relative humidity and wind speed and above average in rainfall. The mean temperature for the month was 25.3°C. This is 1.0°C above the long-term normal for November. The mean maximum temperature of the month was 27.9°C. The highest temperature recorded in the month was 35.6°C, set on November 10, due to the warm southerly winds which were dominated during that morning. This goes on record as the third highest temperature for November since 1946 and exceeded by November 1, 1999, which was 37.2°C on November 11, 1999, and 36.4°C on November 5, 2006. During the month, Bahrain had eight days with maximum temperature exceeding 30°C. The mean minimum temperature of the month was 23.0°C. This goes on record as the fourth highest mean minimum temperature for November since 1946. This is the same as in November 1980 and exceeded by November 1954 (23.3°C), November 1994 (23.2°C ) and November 2009 (23.1°C ). 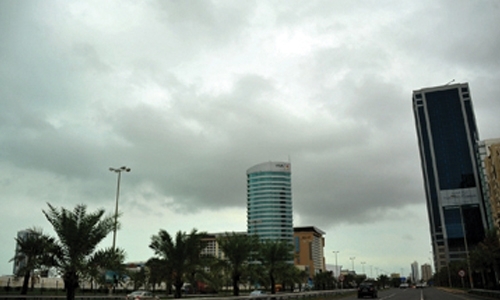 The lowest temperature recorded was 17.8°C set on November 25 at Bahrain International Airport. The mean relative humidity for November was 63 per cent. The mean maximum relative humidity for the month was 75pc and the mean minimum relative humidity for November was 51pc. Total rainfall of 29.0 mm fell over four days in November. Trace amounts were recorded on November 1 and 20. This total was eight times more than the long-term normal for November. The highest monthly rainfall ever recorded for November was 146.8mm, which occurred in November 1940. The highest day with precipitation was 25.2mm fell on November 25. An additional 1.0mm fell on November 11, 2.0mm fell on November 23 and 0.8mm fell on November 24 to make the total amount 29.0mm. Thunderstorms occurred on two days. They were reported at the airport on November 25, reducing the visibility to 2,000 metres and produced a daily total precipitation of 25.2mm. It was due to a deep upper trough which had moved from the Mediterranean Sea towards the central part of Arabian Peninsula and Arabian Gulf with a good feeding of warm and moist air at lower levels ahead of it, which led to the formation of clouds that produced the thundery showers over the Kingdom. The month had a new record for the lowest station pressure, which was 1005.2 hpa set on November 10. The old record was 1007.6 hpa set on November 1, 2014. Shamal winds accounted for 65pc of the observation and 11pc wind observed was prevailing from east to southeast direction with gusts reaching 31 knots on November 10 at Bahrain International Airport. Dust haze reported on November 10 and visibility dropped to 2,000 meters at Bahrain International Airport.